“There is so much doubt and yet so much belief” said Wayde van Neikerk after his win in the second of the three semi-finals of the 400m on Sunday night. The world record holder has set himself a challenge of doubling the 400m / 200m, but the high standard of competition is beginning to bring nagging doubts, even although he looked very controlled with his conservation of energy when he caught and passed Baboliki Thebe to break the line in 44.22. Although initially drawn in the first semi final there was a revision that saved him racing against Steven Gardner (BAH) and Nathan Allen (JAM) who clocked 43.89 (NR) and 44.19 (PB) respectively. With recovery a key factor such a fast race could have been overly-damaging to the South Africans 200m plans. The heats of the 200m begin on Monday evening, with the 400m final on Tuesday. The remaining stadium action on Sunday saw Antonio Alkana, despite clattering some hurdles, progress from the heats to the evenings semi finals. When lining up in the third of the semi’s Alkana had to run 13.23 or better, but a slow start and hitting the fourth last hurdle saw him drop to fourth and record 13.59 and ending his championship hopes. Carina Horn was disappointed with her performance in the 100m World Championships having hoped to have either set a new national record or make the the 100m final. Despite relatively fast times in the heats and semi, Horn’s 11.26 and six place in the semi, put paid to her dreams. She is still unclear as to what 2018 will bring as there are both the World Indoors and the Commonwealth Games in the first part of 2018. There is no morning session on Monday (7 August) but it makes for a big night in South Africa, as Caster Semenya will be the evening highlight in the 1500m final. Although Genzebe Dibaba holds the world record of 3:50.07, she has not recently shown the form of that 2015 Monaco time, whereas Faith Kipyegon has a personal best of 3:56.41 and a season best of 3:57.51 and looks the more dangerous contender. Semenya’s best is a 4:01.99, just outside Zola Budd’s (Pieterse) 1984 record set in PE, but based on her times in 400m and 800m the World double lap champion can run around 3:55, and that could be enough to secure the gold, even with the strong, motivated and diversely talented Laura Muir in the field. There is a strong possibility that this will be a speed race from gun to line as the real contenders know that they risk their potential medals if they leave it to the final 600m or less, as the Semenya turbo boost will come into play and few can match her in such situations. Either way the South African can be expected to go under 4 minutes and Budd’s record is unlikely to be left standing by 22:54 RSA time on monday night. 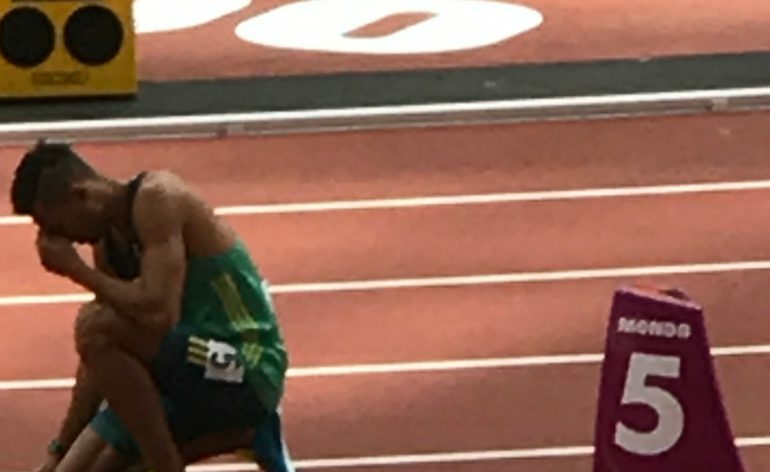 If that is the highlight at the end of the night, then it Wayde van Neikerk who will kick things off in the third heat of the mens 200m (19:46pm) where he has the second fastest PB behind Alonso Edward of Panama, although only the South African has broken 20 seconds this season. That said the 25 year old has already had two taxing rounds of a 400m competition, so nothing is exactly as it looks. Botswana’s Isaac Makwala faces the same torment and challenge of the double, and goes in the fifth heat, with Jamaican Warren Weir an equally impressive opponent. It has all the makings of an exciting and competitive event. Sandwiched between the Wayde and Caster show will be Wenda Nel who opens her 400m hurdle campaign in the fourth of five heats at 20:57.. Yet another excitement packed day at the IAAF World athletic championships in london, and a real prospect of a third medal for South Africa.